The increasing availability of mobile technologies is allowing users to interact seamlessly with a variety of content anytime, anywhere. One of these new Web 2.0 technologies, or technologies that aim at enhancing and creating opportunities for user collaboration, is podcasting (Wikipedia, 2008; O’Reilly, 2005), an online audio and video publishing tool. Podcasts are increasingly being used by language educators and learners, yet in the educational realm, podcasting is still in a development phase as teachers and students are just beginning to experiment with ways to best use the technology. Therefore, few guidelines exist in terms of researching this new technology, specifically with regards to language learning and teaching (Rosell-Aguilar, 2007). In this chapter we begin to close this gap by first providing an overview of podcasting. We then discuss the potential of podcasting to transform ways in which languages are learned. In doing so, we cite illustrative examples of podcasts currently being used by language educators and students, and suggest ways in which the effects of this technology on language learning processes may be researched in order to make pedagogically sound decisions about using podcasts for language learning and teaching. After presenting a case study investigating the use of podcasts at Iowa State University, we conclude with a reflection on the potential for podcasts to transform language learning and teaching. The increasing popularity of mobile technologies, the term often given to handheld devices on which materials can be accessed anytime, anywhere (Kukulska-Hulme & Shield, 2007), has spurred work in the field of mobile learning. Research in this area has focused on using such mobile technologies as cellular phones, personal digital assistants (PDAs), and tablet PCs for learning in formal or informal contexts, as well as the ways in which these technologies challenge learning in the traditional sense (Kukulska-Hulme & Traxler, 2005; Lin, 2007; Vavoula, Sharples, Lonsdale, Rudman & Meek, 2007). Digital media players, commonly referred to as MP3 or MP4 players based on the types of files these players support, have only recently begun to make their way into the mobile learning and mobile-assisted language learning (MALL) literature (Lee, 2006; Chinnery, 2006). Consequently, teachers and researchers have begun to investigate the ways in which podcasts can encourage, support, and transform learning (O’Bryan & Hegelheimer, 2007; Tinker, Horwitz, Bannasch, Staudt & Vincent, 2007). Podcasting is the online publication of audio or video files that users can download and subscribe to using a freely-available podcatching program such as iTunes (Apple, 2008b) or Juice (The Juice Team, 2005). The term podcast came about in 2004 as a mix between the words iPod, the popular MP3 player from Apple, and broadcast (Oxford University Press, 2007). In other words, a podcast is an online broadcast containing a number of individual episodes that can be downloaded to the user’s computer either individually or automatically (i.e. subscribed to) and may be transferred to an MP3/MP4 player; the latter option is what gives podcasting its mobile distinction. Therefore, while a podcast by itself is not a mobile technology, the ease with which podcast episodes can be listened to anytime, anywhere on portable media players enables this technology to be classified as mobile. 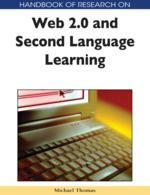 The characteristics of Web 2.0 technologies that make them attractive to language teachers and students, i.e. ease of use, rapid development opportunities, interactivity and community-building, are also true for podcasts and podcast-creation tools. For example, Odeo (SonicMountain, n.d.), PodOmatic (2008), and Clickcaster (2007), are just three of the programs available online to help teachers and students create and publish their podcasts using a browser interface. Many of these programs also allow listeners to post comments in response to a podcast episode, which can contribute to a sense of community and collaboration. Podcast developers may incorporate these comments into future episodes or use them as a guide for choosing content. While podcast-creation tools such as these make it easy to create podcasts, they are not necessary for creating and publishing a podcast. An increase in the amount of open source software available through online sites such as SourceForge.net has also made it easy for teachers and students to download technology applications such as Audacity which allows users to create high-quality, digital audio content while interacting with a user-friendly interface. Content can also be captured on-the-go with cell phones or digital audio recorders. Podcast creators have different interests, motivations and resources available to them, and with the right equipment content can be captured in places as varied as a Tokyo train station, the streets of Athens, or a recording studio in Los Angeles. Integrated Podcasts: Podcasts that are integral components of a traditional or non-traditional course of study. The podcast content overlaps with, elaborates on or exemplifies what is taught in the course. Self-study Podcasts: Podcasts that are on general topics of general interests and designed for a variety of levels of language proficiency. Mobile Technologies: The term often given to handheld devices on which materials can be accessed anytime, anywhere. Vodcast: A vodcast or video podcast represents an evolution from an audio only podcast to include subscribable video content. MPEG-1 Audio Layer 3 (MP3): A digital audio format that compresses audio to a relatively small size, yet is of decent quality. Arguably the most popular file format for digital audio. Podcast Subscription: The allowance of a podcatching program to automatically check for and download new podcast episodes at a time specified by the user, i.e. daily, weekly, monthly, etc. MPEG-4 Part 14 (MP4): A multimedia file format used most commonly for digital audio and video. This format also allows for the storage of subtitles and still images.